The directory includes capability profiles of twine, cordage, rope and netting manufacturers, fiber produc- ers, machinery manufacturers and consultants. A publications catalog listing standards and test methods is also included. Mass. 02043, phone (617) 749-1016; fax 617-749-0542.. Exclusive weight-operated design affords increased flow rates at reduced pressure drops. Easily field tested. Servicing and cleaning requires no tools. Superac Dual Float High Level and/or Overfill Alarm Sensors. USCG and ASTM F-1271 specs. Alarm will not reset if there has been a magnet failure, thus alerting you to a problem before its too late! Our redundant rotary action floats coupled with latch and reset type switches raises high level and overfill sensing to a new standard of performance. When switch opens due to high liquid level, it stays open and must be manually reset. Stakhanovets Ermolenko are smaller and can lift up to 5,500 tons. For years Wijsmuller Transport specialized in the transportation of very heavy constructions like drill- ing rigs and offshore modules. Now the company is able to extend its services and expand its markets by offering a comprehensive service package, the transportation of car- goes from 30 to 30,000 tons on a worldwide basis. 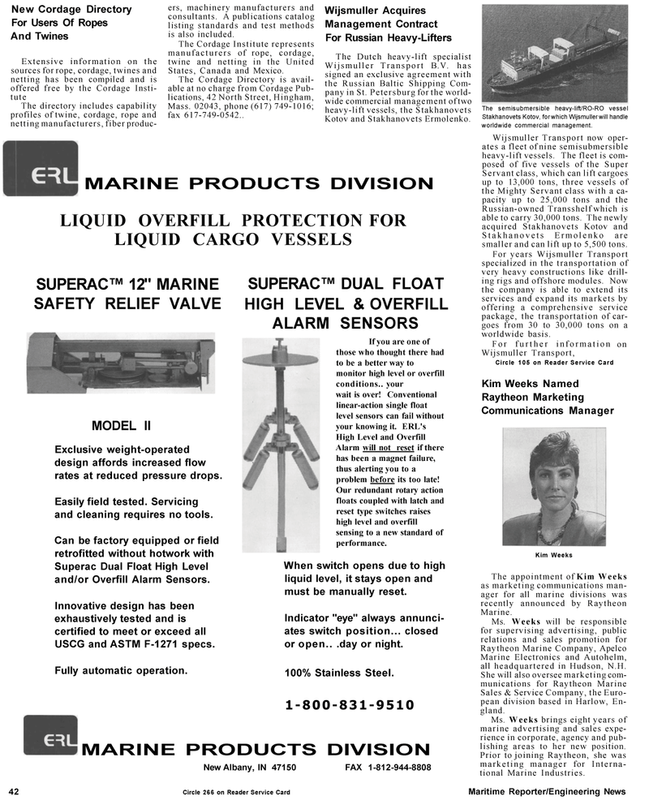 Marine Electronics and Autohelm, all headquartered in Hudson, N.H. Sales & Service Company, the Euro- pean division based in Harlow, En- gland. Ms. Weeks brings eight years of marine advertising and sales expe- rience in corporate, agency and pub- lishing areas to her new position. Prior to joining Raytheon, she was marketing manager for Interna- tional Marine Industries. Stakhanovets Kotov, for which Wijsmuller will handle worldwide commercial management.